The Growing in Grace Preschool Program, which is held in Grace Lutheran Church in Wetaskiwin, decided to try a new approach to safety education this year. Representatives of public safety services were asked to bring their display equipment and talk with the children for one morning at the Drill Hall. Other family members and siblings, as well as homeschooling families, were invited to join in. 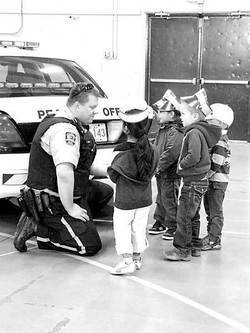 The children were divided into groups of ten or less accompanied by three parents, and the groups rotated through presentations by the Wetaskiwin and Millet Fire Departments, RCMP, a City Bylaw Officer, Guardian Ambulance Services and the Wetaskiwin Public Library display and reading of books about safety. The children were invited to enter the ambulance to see the equipment inside and learn the names and uses of some of it. They got up close with fire fighting equipment, again learning names and uses of less known items. They learned about bicycle and pedestrian safety, and about the work of police officers. They were in small enough groups that they could ask questions and have conversations with the presenters. In the one morning, the children received a complete and well rounded presentation about safety issues. Previously, Growing in Grace Preschool had invited each public and safety service to visit each of the four classes. This would entail 20 separate visits. The Safety Fair provided a rich learning experience while making scheduling easier for both the preschool and the service providers, as well as extending the learning opportunity beyond the children in the classes. By using the Drill Hall, the fire trucks, the ambulance, all of the equipment was indoors so that the children could interact with the equipment and presenters in comfort, no matter what the outside weather. This, too, is an advantage for the Safety Fair. Some of the displays also had handouts for the children, items such as pictures to colour or a cardboard policeman's cap. The first Growing in Grace Community Safety Fair was very successful, a real win-win situation.